Tagged under Hiroshi Shiibashi, Studio DEEN, Series. Well this anime was also not up to expectation but the second season demon capital was so much better than the first one. I really like rihan form there he's much cooler than both the first and third, and his first love, who is possessed by hagoromo gitsune is just dazzling awesome. She's just perfect from every angle. Well, Studio Deen has never really done a bad job with their animations so I admit this show is very well animated and the youkai are well drawn. The art is solid and sharp, it delivers some good moments in combats. The character designs are awesome, unique in their very own ways. Nurarihyon no Mago started off nicely and made me want to watch it, but then as the series went on... I found that the plot was too slow. Ow... i love this anime. So awesome! I like the story about youkai. Dont know how to explain more about this anime but i just want to say....SUGOI na..hahaha. Nura Rihan so handsome! His son Nura Rikuo is so cute. Minna...u all have to spend ur time for watching this anime! Well,what can I say? I've only started watching it.Although I think the plot is a bit slow,it's actually a good anime. The characters are fascinating and adorable and the story can really draw you in.It's not much action.I hope there will be more.The humor is okay,not too much,not too little.But still,I haven't watched to whole thing yet.But I intend to. I'll have my unbiased opinion that this was indeed an interesting Anime. However, the action scenes were lacking, disputes (love triangles, romance, friendships between humans) were not resolved nor developed/explained properly, and lastly, the storyline had that 'mainstream' vibe spurring out of it. 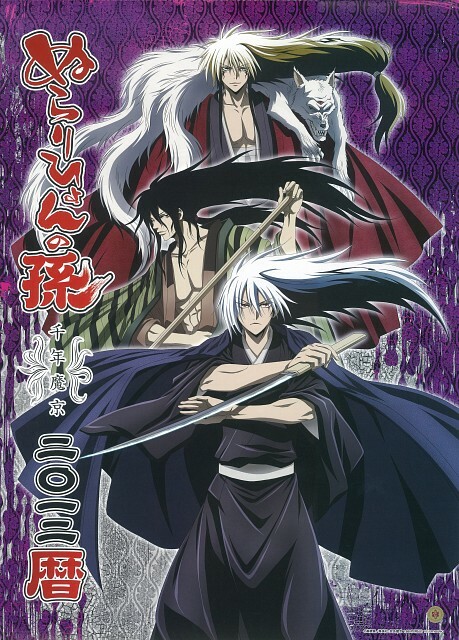 I personally only kept watching because I liked one character (Yuki-Onna / Tsurara). I wouldn't really recommend it, since I would prefer others not waste their time with this. But do so if you must. Another new anime I started to watch. It's fairly good but so far I think the plot is developing too slowly... still, i'm not going to give this up 'cause i like the humour and everything, although the MAIN reason why i'm watching this is because I'm attracted to the main character (as in the one with the white/silver hair)!